Leaked records show that public funds were laundered from the Free State project via Dubai to pay for the family’s showcase wedding. By all accounts, the 2013 Sun City nuptials of the Guptas’ niece, Vega, was a dazzling display of the family’s wealth. The #GuptaLeaks reveal that that the Free State provincial government largely picked up the tab for the “event of the millennium”, as it was described by a guest, KPMG Africa then-chief executive Moses Kgosana. Surely, though, the long list of political and business figures attending the multi-day spectacular were not privy to the veiled source of funds. Except KPMG’s Kgosana should have been. KPMG were the auditors of the Guptas’ Linkway Trading (Pty) Ltd. This company, we shall see, played a crucial role in the diversion of cash earmarked for the Free State’s Vrede dairy project to reimburse most of the wedding expenses – R30 million to be exact. By allowing Linkway to account for the wedding as a “business expense”, KPMG further ensured that the Guptas paid zero taxes on their Free State government windfall. KPMG said this week it was normal for it to attend “client related events”. The Gupta family did not respond to our enquiries. AmaBhungane first revealed in 2013 how the Free State provincial government had gifted an unknown company, Estina, a free 99-year lease to a 4 400-hectare farm outside Vrede. Estina’s sole director was an IT salesman with no farming experience. The government also promised Estina R114-million a year for three years to set up a farming operation and dairy, whose supposed purpose was to empower locals and boost provincial agriculture. Mosebenzi Zwane, now South Africa’s mineral resources minister and then Free State MEC for agriculture, drove the provincial government to adopt the dairy project. Vrede is Zwane’s home town. The project was not put out to public tender. Zwane, among the Guptas’ most ardent defenders, recently claimed the #GuptaLeaks were an attack on committed government employees. Zwane did not respond to our enquiries made earlier this week. In 2013, amaBhungane established that Estina had an address that was also used by Gupta companies and that Kamal Vasram, its sole director, had ties to the Guptas. Despite these signs of Gupta involvement, the family denied any connection save for a R138 000 consulting contract performed by Linkway Trading – coincidentally or not the same company that features in this story. The #GuptaLeaks have unravelled these denials. Dozens of e-mails and other records show the family not only had significant control over the scheme, but diverted much of the provincial government’s funding to it for their own purposes. When Zwane’s successor as agriculture MEC, Mamiki Qabathe, answered questions about the project in the provincial legislature in November 2013, she said that by then a total of R114-million of the government’s money – tranches of R30-million and R84-million – had been transferred to Estina. Financial records in the #GuptaLeaks show that over a six-week period between August and September 2013, Estina had transferred US$8 348 700 (R84-million at the time) to the Dubai bank account of a Gupta-controlled United Arab Emirates (UAE) shell company, Gateway Limited. That is, the entire R84-million second tranche transferred by the Free State government to Estina landed in a Gupta-controlled US dollar account at Standard Chartered Bank in Dubai. The wedding celebrations were held at Sun City over four days at the end of April and beginning of May 2013. 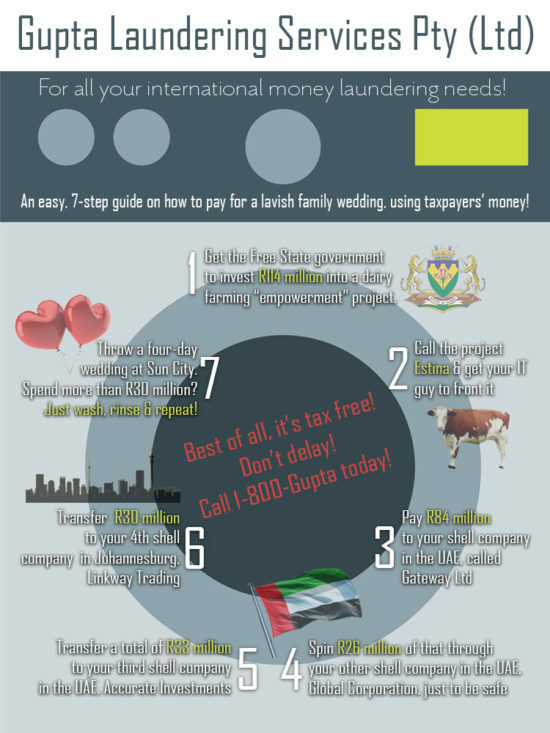 Three months later, on July 31, the Guptas’ Linkway Trading, based in South Africa, presented Accurate Investments Ltd, a second Gupta-controlled shell company in the UAE, with a four-page, itemised invoice for expenses for the “V & A Function … at Sun City” (the bride and groom were Vega and Aakash). The items for which Linkway invoiced Accurate for ranged from R13 086 for chocolate truffles to R2.3-million for scarves, R247 848 for fireworks and R13.9-million for “event services”. Including VAT, Linkway’s bill totalled a perfectly round R30 000 000. It was further noted that “this invoice is the equivalent of USD3 333 400”. As of the date of Linkway’s invoice, Accurate had a mere US$15 811 in its account at Standard Chartered – a tiny fraction of the amount invoiced. But thanks to the Free State government and Estina, Accurate’s bank balance would soon improve drastically. On August 11, 2013 Estina transferred US$1 999 975 of the Free State government’s cash to the Standard Chartered account of the Guptas’ Gateway Limited in Dubai. On the same day Gateway transferred US$1 600 000 of the Estina money to the Standard Chartered account of yet another Gupta UAE shell, Global Corporation LLC. The next day, 12 August, Global transferred US$1 590 000 – that is the full amount it received less $10 000 – in two tranches to another Standard Chartered account: that of Accurate, the company that Linkway had invoiced for the Sun City wedding. That same day, Gateway itself transferred the balance of the funds it had received from Estina plus another $25 to round it off – US$400 000 – to Accurate’s Standard Chartered account. The end result of this financial Three-card Monte was that the Guptas’ Accurate now held US$1,990,000 of the US$1 999 975 of the Free State government’s cash, which had been transferred by Estina to Gateway the day before. Accurate then immediately transferred US$1 986 000 to Linkway’s account at the State Bank of India in Johannesburg. The wire transfer confirmation notes an invoice number identical to the one contained in Linkway’s wedding expense invoice presented to Accurate. This 12 August payment of the Free State’s cash via Dubai, however, fell short of Linkway’s invoiced amount of US$3 333 400 by US$1 347 400. On September 5, 2013, the next tranche of Free State funds arrived from Estina in Gateway’s Dubai account: US$2 999 975. Four days later, on September 9, Gateway transferred US$1 400 000 of this cash to Accurate, which then immediately paid Linkway exactly US$1 347 400 – the balance of the wedding expense invoice. The wedding bill, however, was not the end of the Guptas’ Free State gravy train. Weeks later, on September 23, a further US$3.1-million of the Free State’s cash was washed and delivered to the Guptas in South Africa via Dubai. 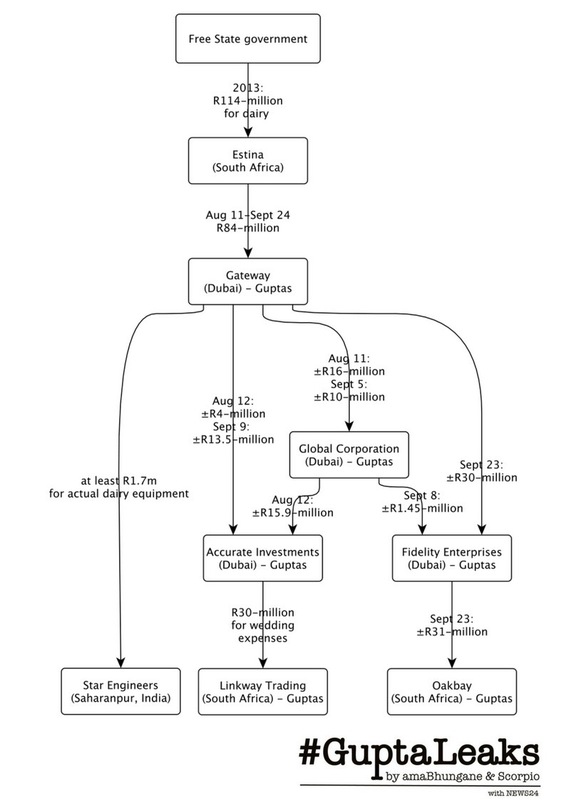 This time, the cash flowed from Estina to Gateway to yet another Gupta UAE front, Fidelity Enterprises Limited, which then transferred US$3.1-million to Oakbay Investments, the Gupta family holding company in South Africa. With so much of the Free State’s money ending up with the Guptas, it appears that very little ended up with actual suppliers to the project. As we previously reported US$3 448 800 (about R34-million then) of the R84-million that was sucked from Estina to Dubai in August and September 2013 was justified by a Gateway invoice for a milk pasteurisation plant to be supplied by Star Engineers, an engineering firm in the Guptas’ hometown of Saharanpur, India. #GuptaLeaks financial records, however, show only a tiny fraction of that — US$165 610 –transferred to Star Engineers during the course of 2013. Whether that was the full amount paid to Star remains unclear. Back-to-back transfers like those seen in the Guptas’ Dubai accounts were obvious red flags. Indeed, Standard Chartered confirmed this week that it closed the accounts in early 2014, shortly after these transfers. By the time Estina was kicked off the project in 2014 following a national treasury probe and amaBhungane’s exposure of dead cows being dumped in a ditch, the provincial government had paid Estina about R210-million in taxpayers’ money. Of that, it is now clear, the Guptas, and not the people of the Free State, were the major beneficiaries. Amidst the #GuptaLeaks revelations, Mineral Resources Minister Mosebenzi Zwane recently unveiled controversial changes to the mining charter. The proposed revisions seem to fit one particular family of Indian immigrants like a glove. Naturalised black people would now also be deemed to have been previously disadvantaged by apartheid, thereby radically transforming the Guptas into prospective BEE partners. The Guptas started arriving in South Africa mere months before the 1994 elections. While Zwane appears to have repeatedly bent over backwards for the Guptas – even going as far as suggesting the #Guptaleaks were driven by anti-black racism targeting him – the leaked documents suggest that perhaps Zwane’s apparent blind loyalty to the Guptas is not entirely reciprocated. Considering the colossal quantum of cash diverted from Zwane’s Vrede dairy project to the Gupta’s pockets, one would assume that Zwane was the Guptas’ guest of honour at the Sun City extravaganza. Rather, he appears to have been an afterthought. Possibly no other document in the #GuptaLeaks trove was circulated as widely and revised so often as the wedding’s guest list. Yet, on the near-final guest list, Zwane’s name – a seemingly late addition near the very bottom (at row 242 out of 254) appearing under the subheading “Extra Guests” – was misspelled as “Mosebebi”, an error which endured throughout the drafts. Even the Guptas’ now-mortal enemy, Peter Bruce, the former editor of Business Day, snagged a higher spot (235) than Zwane on the guest list. While the fate of the mining charter revisions recently tabled by Zwane is uncertain, one thing is clear: with the next generation of Guptas now in their teens and twenties, weddings (and wedding expenses) will continue apace. For all his steadfast efforts to radically economically transform the Guptas, perhaps “Mosebebi” should at the very least demand pride of place at the next one.